How does that song go?! Happiness comes double / After a little pain / If you want the rainbow / You must have the rain. This is most certainly one of those kinds of rides. There are loads of beautiful sections featuring some lovely roads, and there is a small element of what I would call the ugly. 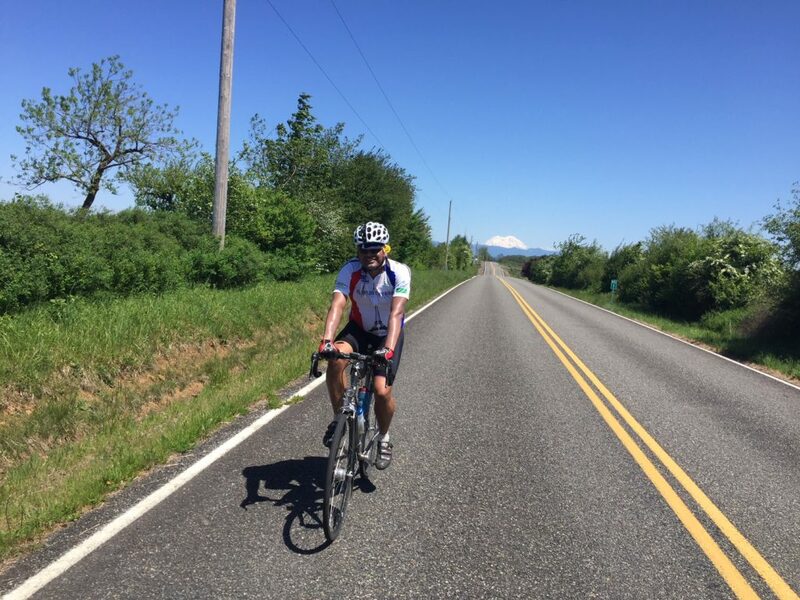 But sometimes you have to keep plodding through the bad (Longview bridge, Longview anything really, Highway 30, Monte–Elma Road) to enjoy the awesome (Spencer Road, Apiary Road, Drew Prairie Road, Smith–Anderson Road, OR 202, Blue Slough Road, and on and on). And the awesome outnumbers the awful by a good margin, so, AWESOME is the overwhelming verdict. Many thanks to Josh Morse, Dewey R. Blacker, Susan Otcenas, Eddie Bishop, and Saint Barbara for all of their efforts this weekend. Especially Saint Barbara. We had GREAT weather. Sorry if we soaked up all the good weather. Three Water Bottle ride, if it’s hot. STOCK UP: Grand Mound or Centralia, no services until Morton. HAZARD: One lane Bridge on the road to Morton. 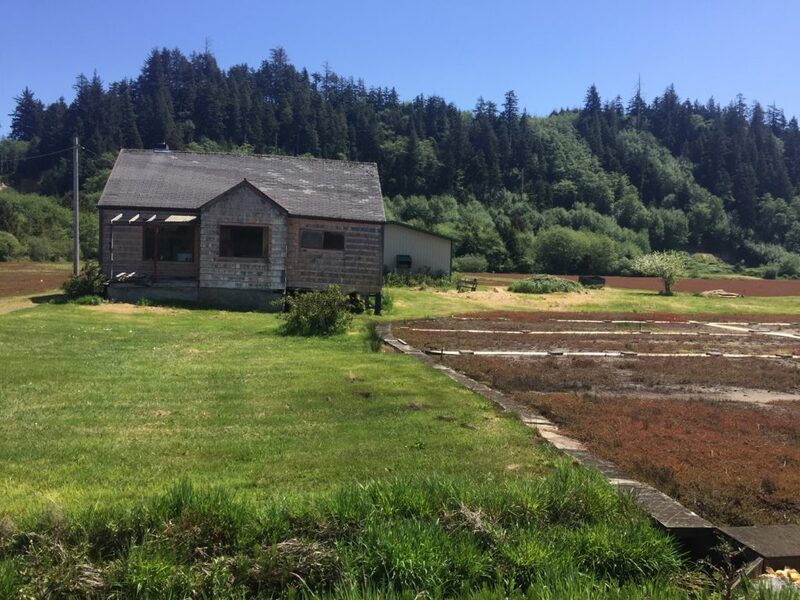 STOCK UP: Morton / Mossyrock / Saikum / Mayfield. HAZARD: Take care on Longview bridge. STOCK UP: Vernonia. Nothing open until Astoria. HAZARD: Cattle Guards, upon turning into Jewell Refuge. 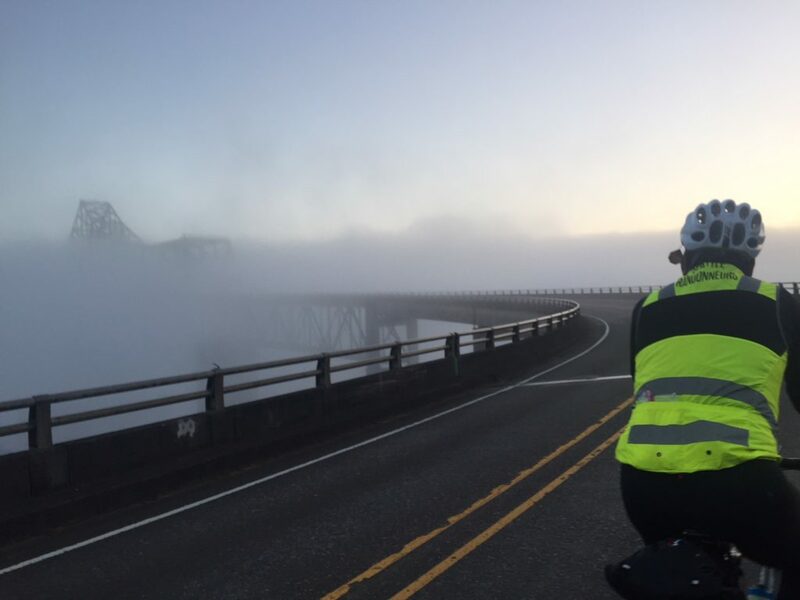 HAZARD: Recommend Taillights on Astoria Bridge. Terrain gets a bit easier after North Cove. FREE BUDDHISM CLASSES in Westport! Save some match sticks for the hills in Olympia / Tumwater. 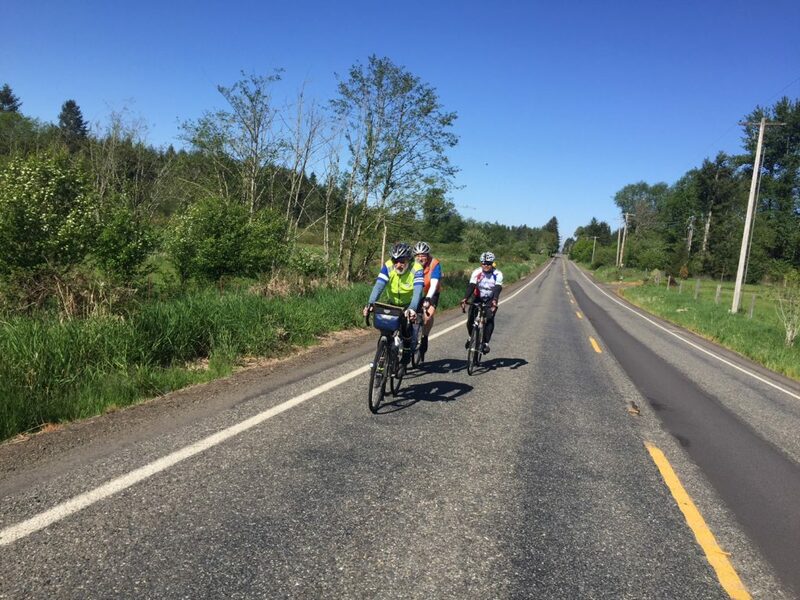 We started off with a nice flat, fast warm-up to Grand Mound, and, a little south of Tumwater, we were treated to a Bald Eagle and her eaglets landing on the road to feast on roadkill—only to fly away at the sight of four marauding bicycles flying down the road. I hope riders on ride-day are as lucky as us! Keep an eye out for them when you pass Freightliner Northwest. At Grand Mound, you should stock up on supplies because there is nothing until you hit Morton; we found the Starbucks to be fast. The shoulder comes and goes after Grand Mound, so be prepared to move into traffic, and keep a watchful eye. Past Centralia, the climbing starts in earnest. It may not seem like much to those of you who finished the Ephrata 400, but it certainly isn’t nothing, either. And Centralia–Alpha road is there to remind you of that. The road was foggy and, though traffic was light, we switched our taillights on. The temperatures climbed as we hit the 508 turn to Morton, so we stopped to take off some layers. There is one little one-lane bridge, so please take care there. At Morton, Josh and Ricky hit the market, while Susan and I hit the convenience store for a quick 10-minute stop. Both locations have been informed of your arrival on ride day. The road out of Morton starts climbing, but it is of the gentle, endless variety and the shoulder is in excellent condition. There are services in Mossyrock, Mayfield, and Saikum (at the store), so take advantage and stock up / top up supplies. 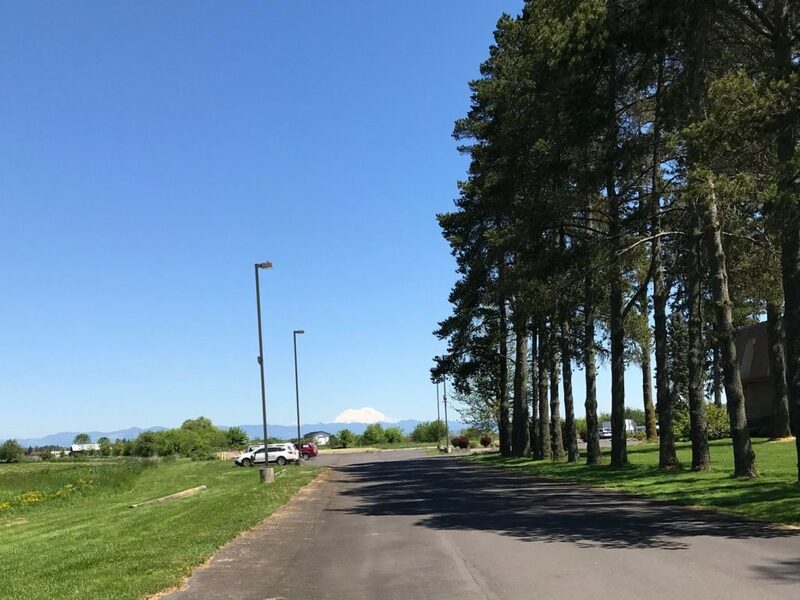 Spencer Road is a gem, and we were blessed with beautiful views of Mount Rainier (behind), and St Helens (to the left). The gang regrouped atop the summit to make a left turn onto Apiary Road. This left turn can be tricky as you have to cross two lanes of traffic, and sightlines are limited for cars coming around the bend. [Update: Route avoids this turn by going into Rainier, Oregon, and up Old Rainier Road. It’s a much more pleasant climb with less traffic.] We paused for a few minutes under a tree where I had one of my numerous “woe is me” moments, but only because I wasn’t aware of the rejuvenating stretch ahead that would remove all the unpleasantness of the last few miles from my brain. Apiary Road was lovely, low in traffic, and had a nice rhythm after the first little steep pitch. There is a false summit, but the climb to there, and the climb to the actual top are very gentle. If you toodle along in your lowest gear you will eventually get there. 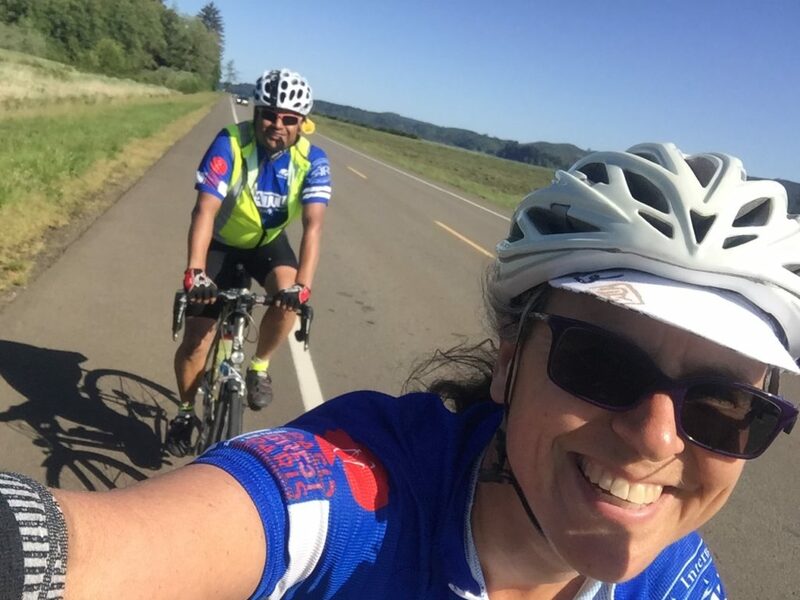 We plummeted down to Vernonia and had a nice ice cream and Gatorade break. Riders may want to stock up here as there are NO services for the next 100K [editor’s note: seriously, there’s nothing]. After a 25-minute break, we left Vernonia and the “hurry up and relax” group threw a Starbucks bottle at us. Luckily their aim was as good as their driving. We stopped a bit after Birkenfeld to dork up for the night because temperatures were so warm that wearing a vest was not appealing. We saw very few cars on this gentle climb. We stopped at the Jewell Wildlife Refuge to use the bathrooms and add layers; watch out for the cattle guards immediately after you make the left turn into the refuge, particularly if it’s raining. I survived the guards, but suffered the disconcerting sight of Ricky doing bridges on the concrete sidewalk. We left together and stayed together. The temperatures kept going lower and lower. A State Trooper kindly asked how many of us were on the road and sounded relieved when we said just the four of us! So look out for police presence on this climb. I didn’t carry long finger gloves (to save weight), and I didn’t want to waste the time putting on my leg warmers. So, I pretty much froze on the descent. The store in Olney was shut up tight. And the lights of Astoria were beautiful in the night. We made it to Astoria a little past midnight, which meant we rode in the dark only for 3 hours. Riders should actually have more daylight than we had, so this promises to be a low night-riding brevet. Saint Barbara helped us get situated, had ordered food and drinks, and catered to our every need as we rested and prepared for bed. A warm shower, lots of pizza, some beer, and a nice FOUR-hour nap (sorry, Susan) all helped me wake up well rested. This is the most sleep I have ever had on a 600K. I hope everyone can get at least some shut eye during the brevet. 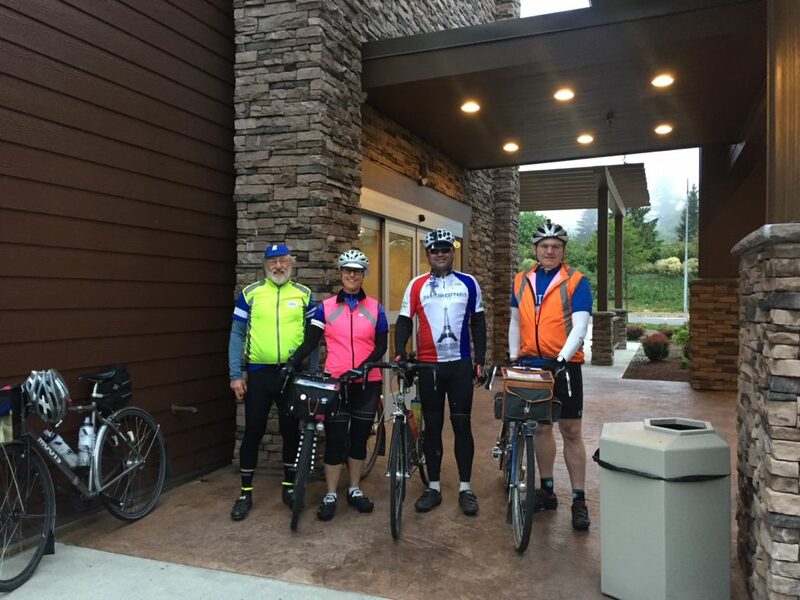 We had a nice breakfast of yogurt, coffee, and fruit (no warm food for us, but the hotel will do its best to have an early warm breakfast on the Sunday of the brevet), and set off with about 10 minutes to spare. 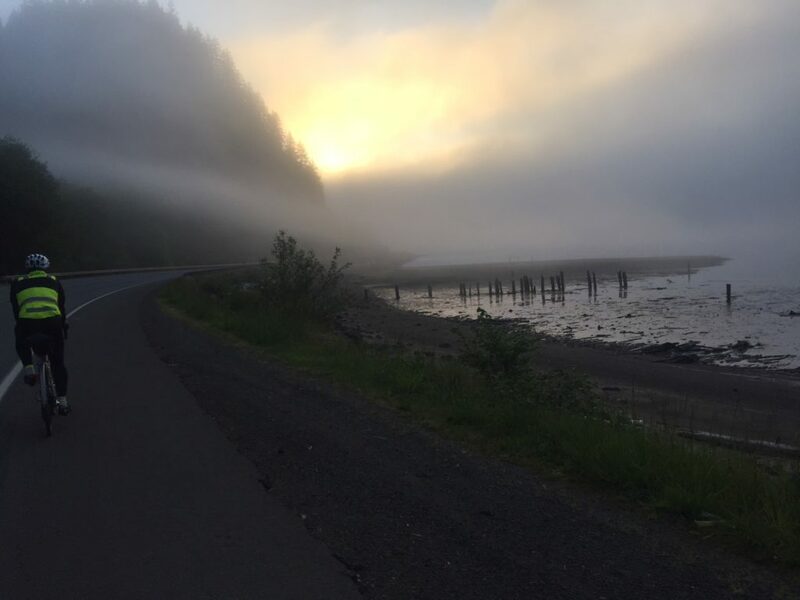 The road was foggy—please switch on your taillights, even if you set off in the daylight. Any bit of visibility on the Astoria Bridge helps. The bridge is long, but the shoulder is adequate, the birds are plentiful, and traffic at that hour (5:45 a.m.) should be minimal. Maybe five cars passed us. The road to Naselle has lovely water views and the golden-hour-light of dawn coloured the trees a beautiful shade. The road gets climby after the right turn on to 101, and I was at my slowest here, but conversation with Susan and frequent breaks for this and that helped me recover a bit. Susan and Narayan heading to Raymond. The day warmed up considerably at Raymond, where we stopped for drinks and a bathroom break. Josh and Ricky opted for a sit-down meal (on Mother’s Day), and bled time as a result. I had another prolonged low and Susan pulled me down the road for miles to the North Cove Grill in Tokeland. There she bought me ice cream and a Starbucks Doubleshot, useful arrows to have in your quiver on a hot day, or if you have had minimal sleep. The road flattens out after North Cove Grill, and the riding gets even more pleasant thanks to a beautiful turn onto quiet Smith-Anderson road which puts you past a whole lot of cranberry farms. We found Heather Road unmarked. It is the first right turn after the road becomes Lindgren Road, eventually dumping you to an unmarked turn onto Highway 105. The control arrives shortly after (the Shell / Subway stop). Here I was taught the finer points of Buddhism by a rather enthusiastic local riding a mountain bike, who may or may not have had all his marbles together, much to the amusement of my riding buddies. He mentioned something about the three colours in the talisman he was wearing, something about the paths, and the monk in Aberdeen… but I am afraid I am a poor student. We left with about nine hours to do the last 72 miles or so and set a good pace as the terrain relented and winds became favourable again. We took the trail to Cosmopolis and then Blue Slough Road, which is now open after the landslides of the past years. 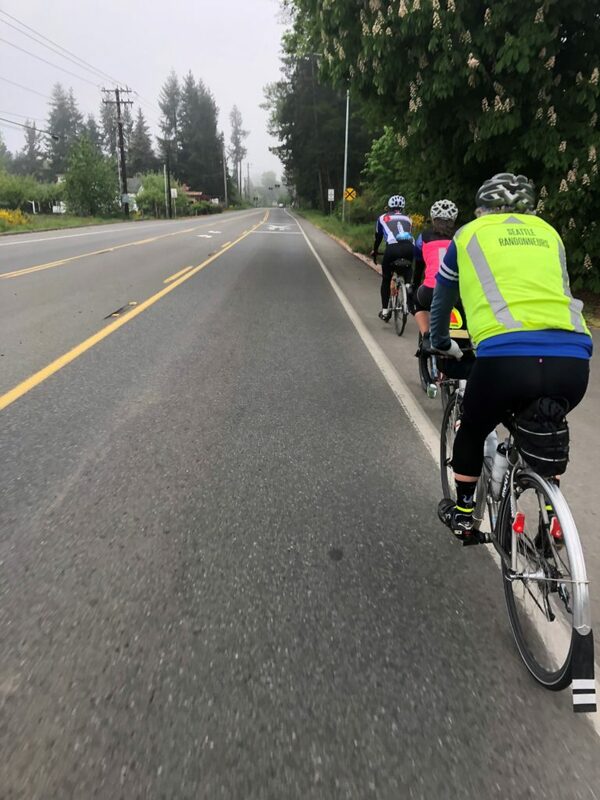 We took an extended break in Montesano, the heat bothering us, and then a few more breaks as we made our way to McCleary. The pavement on Monte–Elma is as bad as ever! Eddie Bishop showed up at the finish with pizza, beer, and G&Ts to welcome us in, and so did Mrs Morse, Ian, and Sierra. It was an awesome end to a wonderful ride. HAVE A SAFE AND WONDERFUL RIDE, ALL! Ride details and registration on the SIR website.